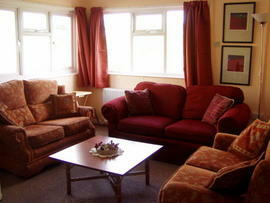 Ideal rural location to enjoy walking, cycling, bird watching and fishing around Maenclochog in North Pembrokeshire. 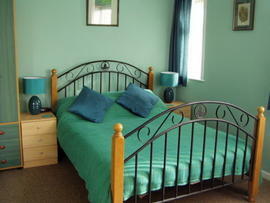 Close to the famous Gwaun Valley and other beautiful and historic sites. Pub and village shops within walking distance. Situated below the ancient Preseli Hills, Ty Pren Bach is the ideal location to explore one of Wales' most beautiful and magical landscapes. These hills, blue stone country, provide great opportunities for walking, horse riding, cycling, bird watching and botany not forgetting both trout and salmon fishing. 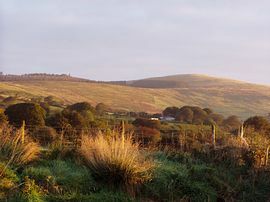 You can walk up to the highest point of the Preseli Hills - Cwmcerwyn - directly from the property or drive a short distance to park close to the ancient Golden Road and Foel Eryr. The beautiful and dramatic Cwm Gwaun is only a few miles drive. The valley, which is in the Pembrokeshire National Park, is famous for its woodland, streams and wild life including otters, dippers and buzzards. The local pub, the historic Dyffryn Arms(Bessie's)at Pontfaen, which is one of CAMRA's heritage pubs, is well worth a visit. Ty Pren Bach is on the edge of the village of Maenclochog which is conveniently placed within 12 miles of Narberth, Haverfordwest, Newport or Cardigan. The village has shops, post office and pub all within walking distance. It is also on the route of the Preseli Green Dragon walkers bus. Fishguard and Goodwick are only 6 miles away for a day trip to Ireland with Stena Link. 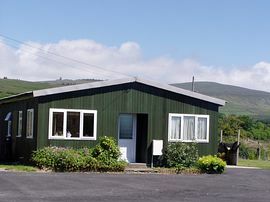 Rosebush, which is only a mile away, boasts the famous Tafarn Sinc and the Old Post Office. Both offer excellent food and real ale. Other places of interest include Carn Ingli, Castell Henllys, Beddarthur, Pembrokeshire Coastal Path, and Brynberian. Ideal for quite holiday the fantastic view. Ideal for an active holiday for cycling and walking. Bed linen provided free. Towels can be hired at £8 per set. Patio furniture and barbeque. Bicycle storage. 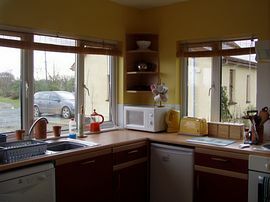 Local Services: Post office, shops, pub, petrol stations in villiage-all within walking distance. Bus service to Haverfordwest and Fishguard weekly. On route of Preseli Green Dragon Bus. Turn right at Narbeth on to B4313. Turn left on to B4329 and left again at New Inn on to B4313. Bus weekly from Haverfordwest. Bus weekly from Fishguard. Nearest train staion Clarbeston Rd 7miles away. Out of season or short breaks can be negotiated by phone.